This page contains a single entry by Westley Annis published on March 27, 2007 10:36 PM. Senate District One - Early Rumors was the previous entry in this blog. Thibodaux and Lafourche Spring Elections is the next entry in this blog. Can John Breaux Run For Governor? The number one question in Louisiana today is whether or not former U.S. Senator John Breaux can run for Governor of Louisiana. He has asked for an opinion by state Attorney General Charles Foti as whether or not he can run. The simple fact here, as many pundits are cheerfully explaining, an opinion from the Attorney General's office doesn't mean squat and has no bearing whatsoever on how a judge may rule in the matter. Two state legislators, Senator Noble Ellington-D and Rep. Jim Tucker-R, have written a letter to Foti claiming that he does not have a basis for issuing an opinion since the question is not a matter of law but a matter of fact. No one is questioning the law, candidates should be "a citizen of the United States and of this state for at least the preceding five years". They are questioning whether this fact is true or not, "John Breaux has been a citizen of the United States and of this state for at least the preceding five years." Until the validity of this statement is proven in a court of law, there is no way to tell if Breaux is a five-year citizen of the state. There are two basic ways at looking at this. One, from the state Democratic Party point of view: Breaux has owned property in the State of Louisiana and paid the taxes on that property for at least the last five years. This qualifies him as a citizen of the state. With no clear definition of citizen in the state constitution, the state Democratic Party believes the court's will tend to rule in favor of a Breaux candidacy since it would provide the greatest number of candidates for voters to choose from. Two, from my point of view: When determining if a person has a right to run for office in a particular area, the courts follow the more clearly defined definition of residency. The yard stick for that determination is the homestead exemption. Wherever area a person's homestead exemption is recorded, that is where they mus"reside"e, therefore, that is the area that can qualify for political office. In John Breaux's case, his homestead exemption is in Maryland, which also happens to be the address on his driver's license and where he is registered to vote, which is another requirement for qualifying for the governor's race. Knowing the question that needs to be answered, it now becomes a matter of when the question can actually be asked and to whom it can be asked. 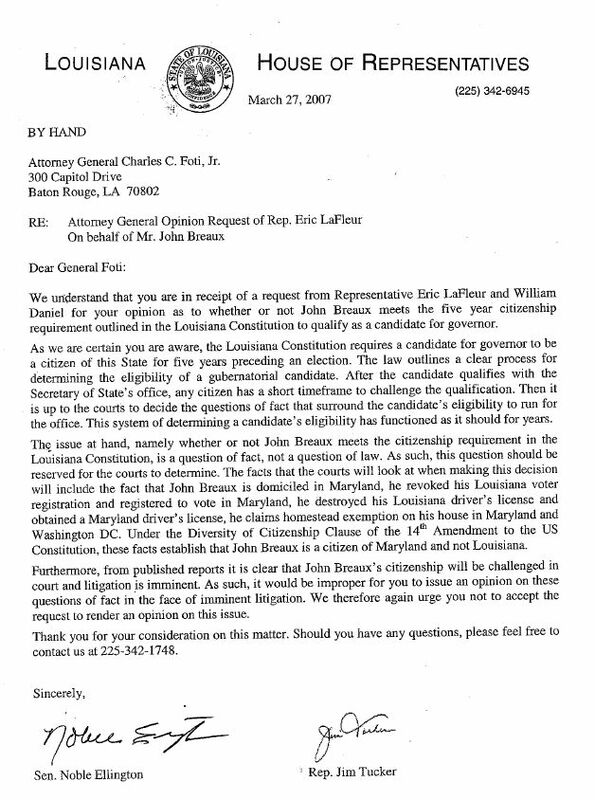 In this case, all indications are that the question cannot be asked until John Breaux officially files the paper work to qualify as a candidate, which cannot be done until September. At that point, the question of fact will need to be presented to a judge and not to the Attorney General's office. Listed below are links to blogs that reference this entry: Can John Breaux Run For Governor?.